Gent is a beautiful city with a long and storied history, as well as a vibrant current events scene. For kids and adults, exploring, learning about, and getting involved in our new city are all exciting aspects of being an expat. Here are some ways my family has found to do so. Be a tourist in your own town! There are a few ways to learn the lay of the land, and many sites to visit, which can all be fun, positive learning experiences for children. You can join a group for a guided tour through Visit Gent and the Gent Guides (some free, some require registration), Vizit guides, or from Gent Free Walking Tours, but if you don’t think your kid(s) would last the one or two hours in the company of strangers, try a self-guided tour! Visit Gent suggests a number of routes, but I think the following walking tours are particularly fun for kids. The walking route in the “Where are Fosfor the Dragon’s glasses?” app from Visit Gent is made specifically for kids. You can download the app to your smartphone or tablet from the Apple and Google Play stores. It takes you on a two-hour (approximate) quest through the city. 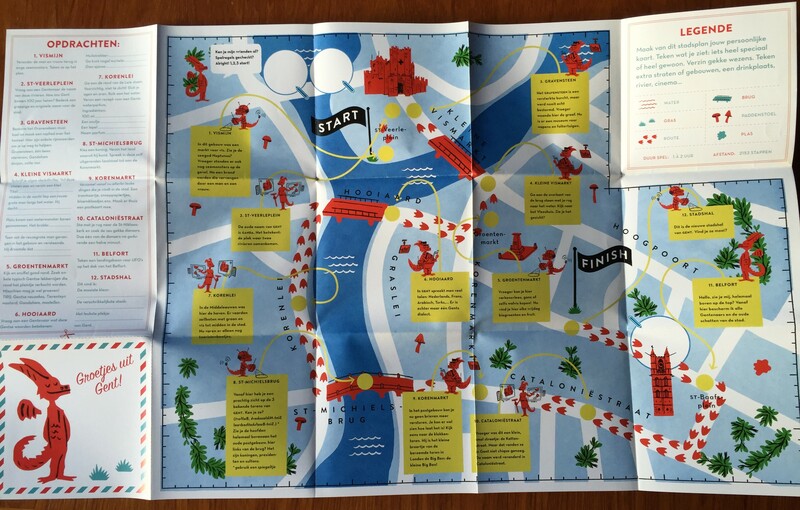 Gent’s 2013 Stadsplan Voor Kinderen. If an app isn’t your thing, check in the Visit Gent office for a printed copy of their 2013 Stadsplan Voor Kinderen. Just like the Fosfor the Dragon app, it guides children on a quest through the city with Fosfor, learning about important historical sites along the way. 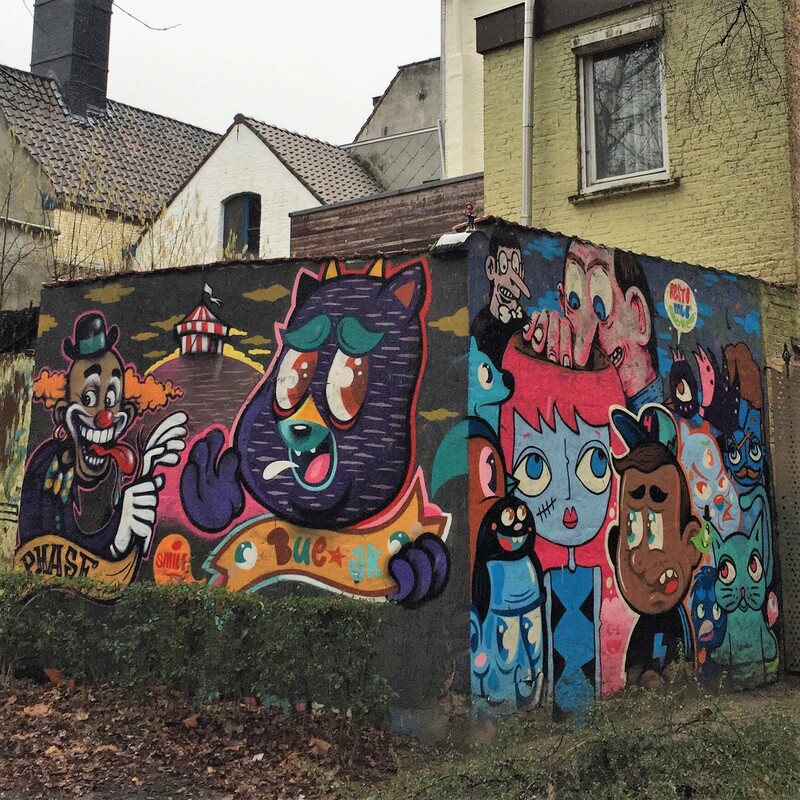 Finding bright, colorful street art in Gent can be like a treasure hunt! A completely different approach is to tour the city’s graffiti/street art. My son and I are always on the hunt for vibrant, interesting street art that we haven’t seen yet. It’s like a treasure hunt! I have found two organized guides for this as well. The Concrete Canvas Tour is a product of Street Art Belgium, supported by the city of Gent. Their website lists fixed, guided tour dates, but you can pick up a printed map and guide at Visit Gent tourist information office to do your own walking tour at your own pace. Another tour of Gent’s street art is by Sorry, Not Sorry, also supported by the city of Gent. You can also find a printed brochure and map of their street art trail at the Visit Gent tourist information office, or view it on your smartphone or tablet from the Sorry, Not Sorry website. 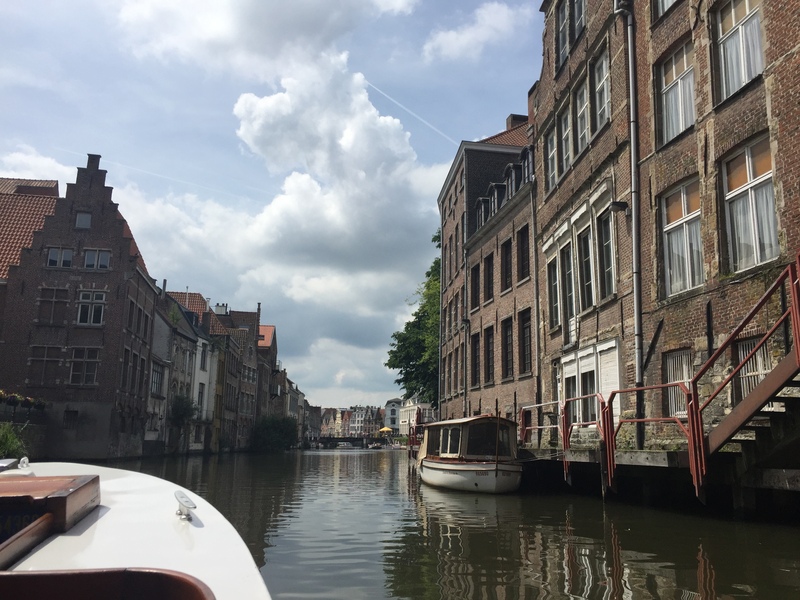 View from a boat tour in Gent. If not by foot, kids might enjoy seeing the city by boat! There are a few competing companies that offer boat tours from the Korenlei and Graslei, as well as the Hop On Hop Off water tram. You can also reserve a smaller boat tour with a private captain. If you’d like an even smaller boat, you can rent one to navigate yourself from the providers listed here. Kayak and canoe tours are offered from the Blaarmeersen (including a lovely evening tour by torchlight), from Nomad and Rebel, and from Kajaks Korenlei. Sup Tours Gent offers StandUp Paddle tours (read The Square.Gent’s review of Sup Tours here). VlotGent offers solar- and wind-powered floating living rooms. Performances during the 2016 Feest in het Kasteel at Gravensteen. Another way to explore and learn more about Gent is to visit its historical sites individually. There are many sites united under Historische Huizen Gent that can be fun for children to visit. It’s impossible to talk about being in Gent with kids without suggesting a visit to Gravensteen, The Castle of the Counts. A castle tour includes displays of armor and weaponry, and beautiful 360 degree views of the city. The tour also takes you through “The Museum of Judicial Objects,” which is a nice name for an impressive collection of torture devices. So, depending on your child’s age and maturity, you might want to hurry past the two rooms with the guillotine and torture rack, among other things! 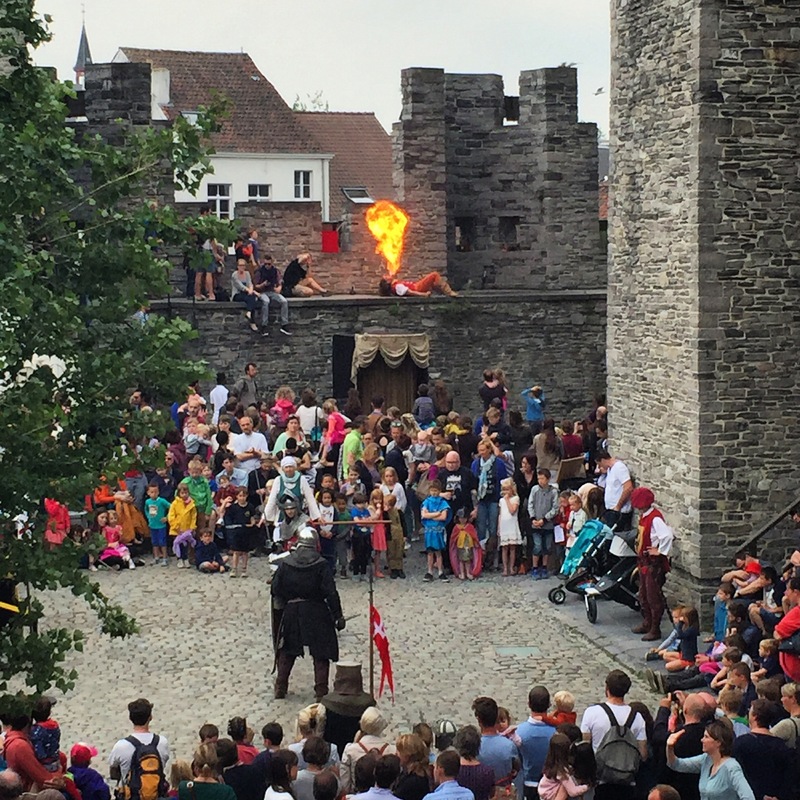 Gravensteen has special events for children throughout the year, like its Feest in het Kasteel in May, or its transformation into the Winter Wonder Castle during Gentse Winterfeesten. On past Heritage Days, children could be knighted in the Castle. I have found that the best way to stay informed about the events at Gravensteen is to follow the Historische Huizen Gent Facebook Page. The ruins in the garden of Sint-Pietersabdij (St. Peter’s Abbey). The Belfort Gent is another great place to get breathtaking views of Gent in every direction. They have activities for children when they visit. On the way to the top, kids can enjoy seeing a collection of former dragons who used to sit atop the Belfort, a collection of historical bells, and the inner workings of the carillon. Unlike other Belgian belfries I’ve visited, ours has an elevator to carry you up some of the levels. Glass elevators are fun, and climbing narrow, steep stairs can be hard for little ones, so this is a plus in my book! In good weather, the garden of Sint-Pietersabdij (St. Peter’s Abbey) is a great spot for a picnic. Its orchard, vineyard, and herb garden create a nice setting in the spring. My son loves exploring the ruins there from the medieval infirmary of the monastery. 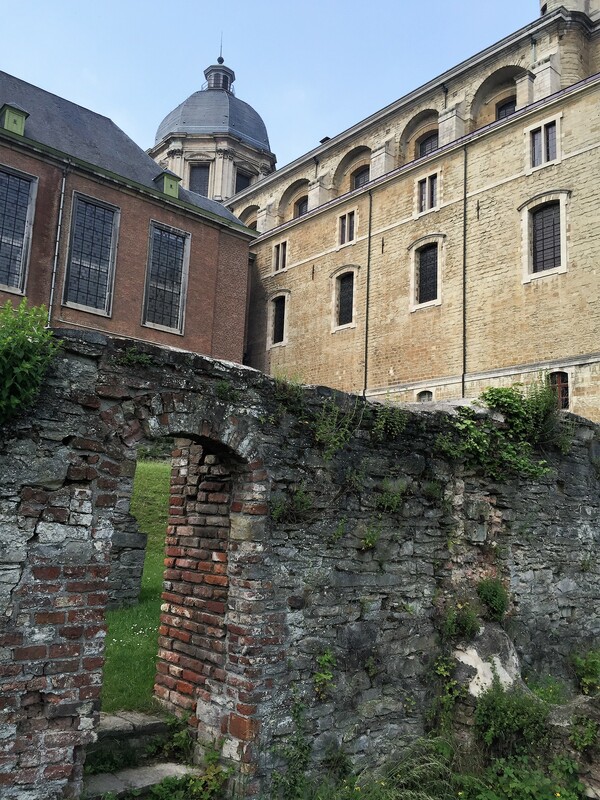 Not to be confused with St. Bavo’s Cathedral, Sint-Baafsabdij (St. Bavo’s Abbey) is another great site for kids who like to explore ruins and gardens. Not much of the original Abbey remains aside from a medieval refectory, but the site’s gardens contain columns, statues, and other ruins brought to this location from other Gent buildings that have been demolished. Be sure to check the opening hours before you visit this site because it is seasonal and has limited hours even in the peak season. While it is fun to learn about history, it is also nice to be active in the present day! I have found that Gent has a great respect for children as valued residents and has a lot to offer children if you know where to look. Stad Gent has a website for children with links to current events for kids, play and craft ideas, games, and camps and vacations. Uit in Gent has a specific search page for you to use to find things to do/see/hear/visit in Gent with kids. Visit Gent also has a section of its website devoted to visiting Gent with children. Just as I mentioned in Part 2 of this series when discussing museums, some of the historical sites hold events and activities for kids during school holidays and special days like Erfgoeddag (Heritage Day) and Kunstendag voor Kinderen (Arts Day for Children). I recommend following their websites and social media pages, and signing up for their email newsletters if they have them, to get the latest news and events sent straight to your inbox and newsfeeds. The Gentse Spruiten Facebook group mentioned in part 1 of this series is also a great resource for current events for kids in Gent. I’ve linked to websites and resources everywhere I can in this series of articles to help you find current events and things to do in Gent with kids. Have fun out there!